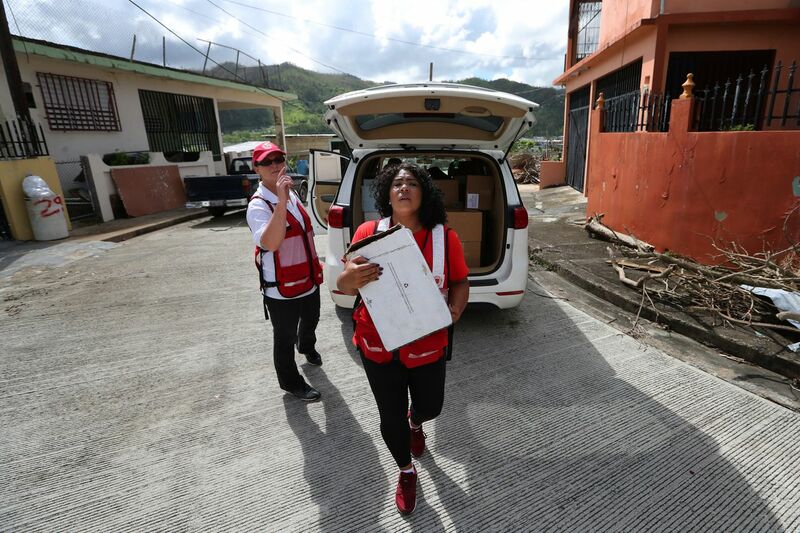 Quetcy Lozada, Philadelphia, spends her last day of two weeks as a volunteer for the Salvation Army delivering water in Cayey, Puerto Rico, Tuesday October 31, 2017. WASHINGTON - A massive emergency aid bill for victims of hurricanes, wildfires, flooding and other natural disasters was defeated in the Senate on Monday amid a fight between Democrats and President Donald Trump over relief for Puerto Rico. Senate Democrats opposed the $13.45 billion legislation, saying the $600 million included for Puerto Rico's food stamp program is inadequate to meet the U.S. territory's needs as it attempts to recover from Hurricane Maria. The Democrats are embracing a House-passed relief bill containing hundreds of millions of dollars more for Puerto Rico than the GOP version, but it, too, failed to advance Monday as Republicans opposed it. It's unclear whether Congress and the administration will move forward to revive the emergency package, and the impasse risks indefinitely delaying disaster funding nationwide amid partisan sniping. Support for disaster aid is often bipartisan on Capitol Hill, but the dispute over this legislation has become increasingly bitter, despite the evident need around the country. "This is no time for our colleagues across the aisle to prioritize a political fight with the president ahead of the urgent needs of communities across our country," Senate Majority Leader Mitch McConnell, R-Ky., said on the floor of his chamber Monday. "This does not need to be a difficult partisan decision." "Democrats should stop fighting Sen. David Perdue's disaster relief bill. They are blocking funding and relief for our great farmers and rural America!" Trump wrote. But Democrats are furious over Trump's reluctance to send assistance to Puerto Rico, a stance the president has articulated in private meetings with aides and repeated last week in a closed-door lunch with Senate Republicans. "Republicans must remember that - just as we leave no soldier behind on the battlefield - we help our fellow Americans when there's a disaster, wherever the disaster strikes," Minority Leader Charles Schumer, D-N.Y., wrote in an opinion piece published in the New York Daily News over the weekend. "We do not abandon them. Period. The president and Senate Republicans' actions on Puerto Rico can be described in only two words: cruel and nasty." Trump said last week that he's taken better care of Puerto Rico than any human being living. Puerto Rico's governor, Ricardo Rosello, a Democrat, recently described Trump as a "bully" and threatened during an interview on CNN to punch him in the mouth. Rosello has publicly called on Congress to approve House Democrats' version of the bill - although without specifically opposing the Senate GOP version. House Democrats' bill does not include funding for the historic flooding that swept through Iowa, Nebraska and other Midwestern states in mid-March; that measure was completed and passed in January. That gap has allowed Republicans to argue that their bill, which would make billions of dollars available to the Midwest, is the only piece of legislation that addresses the nation's disaster needs in their totality. The emergency legislation, which has been pending in one form or another since last year, addresses an array of disasters that have befallen different parts of the nation in the past couple years, among them: an earthquake in Alaska; volcanoes in Hawaii; California wildfires; last year's hurricanes that hit North Carolina, South Carolina, Florida, Georgia and the central Northern Marianas Islands; the 2017 hurricanes in Puerto Rico; tornadoes in Alabama and Georgia; and flooding in Iowa, Nebraska and other Midwestern states. The congressional impasse has already led to cuts of about 25 percent to the food stamp benefits received in March by the 1.3 million Puerto Rico residents - 43 percent of the island's population - who rely on the program. If Congress does not pass the funding soon, those people will again have the reduced food stamp allocation. The island's government has also had to cut the size of a supplemental cash benefit to the food stamp program that many elderly Puerto Ricans say they use to buy basic necessities, such as detergent and toothpaste. Rosello says that the food stamp money is criticial for Puerto Rico and that other federal assistance is also necessary, such as money for reconstruction projects and debris removal, and other measures that were included in House Democrats' legislation. The House-passed legislation also included $849 million in Environmental Protection Agency funding for Puerto Rico, as well as a measure that would ensure FEMA picks up the tab for reconstruction projects on the island, as the federal government did after Hurricane Katrina and Hurricane Sandy. In a letter in January, the Trump administration derided the extra EPA funding as "excessive" and worried the FEMA money would go to projects unrelated to the hurricane. It also initially opposed the extension of emergency food stamp aid as "excessive and unnecessary."